This week Mike and I headed south to try the new Workshop Eatery – which just opened mid-November. The Workshop Eatery is located in The Mosaic Centre at 2003 91 Street SW in south Edmonton (way south, past Ellerslie and south of the Anthony Henday). The SW part of the address is important because if you select the NW location as I did in my Google Maps (because that was the preferred address Google wanted me to tap lol), it will take you the wrong way. Whoops! The Workshop Eatery located at 2003 91 Street SW (in the Mosaic Centre). Workshop is the product of the talented, and well-known (certainly in the Edmonton/Alberta area) Chef Paul Shufelt, who had for years led the successful kitchens of the Century Hospitality group of restaurants (Lux, Delux, Hart’s Table, MKT, Parlour). Paul left Century Hospitality after 10 years to start Workshop. While not all of our ingredients will be found in our backyard, when it’s the best choice we will choose to support local. While refined, our cuisine is handcrafted, approachable and unpretentious. We will make just about everything, down to the jams, dressings and even our ketchup, in house. The few items we don’t prepare ourselves, like our breads, will be provided by the best we can find. Our greatest emphasis will be on capturing the flavours of the season, highlighting them at their peak, and preserving them to savour throughout the year. Inside The Workshop Eatery at 2003 91 Street SW (in the Mosiac Centre). The first thing I noticed when entering Workshop is how much brighter is is compared to so many restaurants in Edmonton that are in similar price ranges. Restaurants are increasingly dimming their spaces (science apparently says you’re hungrier in a dark room, but probably it’s just because dimly-lit sets a certain vibe so many places like to go for?) but Workshop’s brighter lights were certainly pleasing to me – especially me because I like to be able to see and photograph my food! It’s also very open, and has a nice, spacious, and home-y feel to it. It’s comfortable. Inside The Workshop Eatery at 2003 91 Street SW (in the Mosaic Centre). Workshop’s one page menu is pretty varied – with something for everyone, I think – from steak to fish, pork to duck, and lots from the garden – there’s even perogies! (See their current menu here). They also offer a brunch menu (need to try those “Bananas in Pyjamas” banana bread French toast with nutella, almonds, and a Saskatoon berry compote, mmm) and a selection of sandwiches for lunch. Chips & Dip (kettle chips with five-onion dip) at The Workshop Eatery ($7). Mike and I were invited for a media night, so we wanted to try a few different things to get a more rounded experience to share with you readers! We started with the classic Chips & Dip (kettle chips with five-onion dip – $7). I always think it’s funny that I can be at a really nice place and my first inclination is to get chips if it’s offered and it’s always (obviously) a bonus if the chips are excellent – which in this case yes, yes they were. We also had the Arancini (creamy risotto balls – lightly breaded and crispy, filling changes regularly – that evening it was a ‘New York Deli’ with a balsamic tomato smear – $12). Our particular Arancinis that night was a “New York Deli” style with balsamic tomato smear – at The Workshop Eatery ($12). We shared the Kimchi BBQ Lettuce Wraps (with fresh veg, rice vermicelli, toasted peanuts, butter lettuce, and watercress yogurt – $15). The Kimchi BBQ Pork Lettuce Wraps – with fresh vegetables, rice vermicelli, toasted peanuts, butter lettuce and watercress yogurt at The Workshop Eatery ($15). Riverbend Gardens Beets – roasted pickled, fluid gel, fennel, with Smoky Valley goat cheese and candied pecans at The Workshop Eatery ($14). My favourite of the starters were the chips (but really! So good), along with the delicious, refreshing, and colourful trio of beets. The other two dishes were good but they didn’t necessarily stand out for me that evening – I’m also not a big balsamic fan so just that particular arancini feature of the night just might not have clicked. The creamy risotto part of it was good. And also, due to the varied menu – there’s still so many other appetizers you could order that we didn’t get to try! The Token Steak Dish – baseball cut Heritage Angus Beef sirloin skillet seared, with herb & garlic butter, crispy brussel sprouts, chorizo cheddar tater tots and a sriracha sour cream – at The Workshop Eatery ($34). For our mains, Mike got the “Token Steak” which is a skillet-seared baseball cut Heritage Angus Beef sirloin, with herb & garlic butter, crispy brussel sprouts, chorizo cheddar tater tots and a sriracha sour cream ($34). 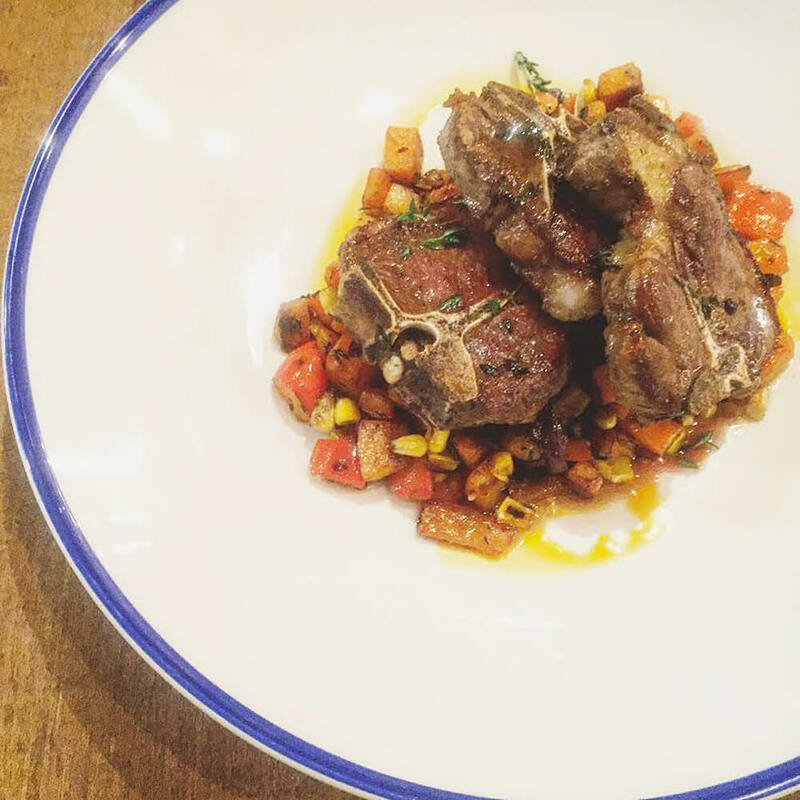 Feature Tangle Ridge Range Lamb Chops with butternut squash, corn, and bacon hash at The Workshop Eatery ($33). I got the feature special that night – the Tangle Ridge Ranch lamb chops with butternut squash, corn, and bacon hash ($33). It’s not on the menu all the time, but Tangle Ridge Ranch is one of the many local producers Workshop will work with throughout the year so I’m sure there will be many variations of the type of lamb dishes offered at Workshop. And I thought my lamb chops were incredible! Juicy, tender, with great seasoning. My hash though was unfortunately missing the bacon (always more bacon pls), but the butternut squash and corn complimented the chops well, and don’t let the photo fool you – I thought the three lamb chops were pretty big portions that stuffed me right up (though keep in mind I had 4 appetizers to start lol). Croissant Bread Pudding – white chocolate & cranberry, with Pinocchio’s cinnamon ice cream ($9). We were thoroughly stuffed by the time we finished our main dishes but we wanted to give one of the desserts a try. Workshop offers four kinds of “Happy Endings” – a honey and yogurt panna cotta, a chocolate fondant, a warm apple crisp, and a croissant bread pudding. We ordered the Croissant Bread Pudding – white chocolate & cranberry, with Pinocchio’s cinnamon ice cream – $9), which was delicious and a perfect way to end the meal! You do get a Century Hospitality-type of feel with Workshop’s food, which maybe then won’t appeal to people who live or work closer to actual Century Hospitality spots, but for those in the area, I think it’s perfect. I also don’t see the Century Hospitality-type feel as a bad thing (there’s a reason why that restaurant group has so many successful restaurants operating in the city). I know Paul has said with Workshop he’s getting more freedom to create what he wants to create, so it will be interesting to see where he takes the menus going forward, especially with their own garden, beehives on the roof for fresh honey, and their focus on doing as much as possible from scratch. Dinner prices at The Workshop Eatery are on the higher-end (those $30-range main dishes are noticeable) but these prices are also on par with a lot of other restaurants (if you’d shell out $30-$40 for a steak almost anywhere else – and at chain restaurants – it shouldn’t be an issue to do it at Workshop). The Mosaic Centre where The Workshop Eatery is located is a really cool space! Workshop is located in the ‘burbs. Near Ellerslie and Summerside, it might be a turn-off for some people, but I actually think it’s a very smart place to be located, and I think it will serve them well. Good restaurants that open away from the downtown core – they do well and Workshop is a good restaurant! Overall, I would certainly recommend Workshop and happily return for dinner, plus brunch! (Would be hard for me to make it across the city during my lunch break though ;)) P.S. They also offer a lot of gluten-free options (see my friend Sharman’s gluten-free friendly review here! Congratulations to Chef Paul Shufelt and team! Opening a restaurant (or starting any business) is a huge, huge undertaking, and they should be so proud of this lovely little spot. So have you been to The Workshop Eatery? What did you think?! Disclaimer: I will always provide my 100% honest opinion on this blog. I was invited to Workshop Eatery for media night a guest. This has no impact on opinions stated in this post. i noticed that your reviews on restaurants that actually invited you for dinner are more positive than other restaurants that you had to pay to review there food. however i like that you are supporting local independent restaurant as the restaurant chains are killing this city, more and more are opening and that`s NOT good monopoly. I do agree with you though on supporting local – I try to support local, independent restaurants wherever possible! Though I believe chain restaurants do find success partially due to consistency which can be hit or miss for certain, smaller restaurants.